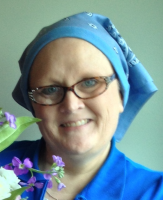 Patty A. Wann, 48, of Frankfort passed away Thursday, January 23, 2014, at the Midwestern Regional Medical Center in Zion, IL following a 5 year battle with cancer. She was born March 17, 1965 in Frankfort to Gearren “Bo” and Diana (Spray) Bodish. She married Marc Wann on October 17, 1987 in Lafayette and he survives. Patty was a 1983 graduate of Frankfort Senior High School and a 1987 graduate of Purdue University with a BA in Retail Management. She worked at Frito Lay for 23 years, most recently as a Fleet Administrator. She was a member of St. James Lutheran Church in Lafayette and attended St. Matthew United Methodist Church in Frankfort. She was the Chairperson for the Clinton County Relay for Life Planning Committee and Co-Chairperson, along with Heather Matthews, for the Frito Lay Team. Along with her community service, Patty’s dedication to her family was beyond measure. Surviving along with her husband, Marc are her Daughters: Meghann Wann of Frankfort and Madison Wann (Fiancé: Harvey Young) of Owensville, IN; Mother: Diana Bodish of Frankfort; Sister: Cindy (John) Shields of Frankfort; Father & Mother-in-law: Aaron and Barbara Wann of Frankfort; Brother-in-law: Rodney Wann; Nieces: Morgan and Kelsey Shields both of Frankfort and Katelyn Wann of Rossville; Life Long Friend: Cindy Morton of Lawrenceburg, IN; Several Aunts, Uncles, and Cousins; and she was expecting her first grandchild, with Madison, in June of this year. She was preceded in death by her dad, her grandmother: Eunice Spray, her uncle: Rex Spray, and her nephew: Baby Bo. Funeral services will be held at 10:30 a.m. Tuesday, January 28, 2014 at the St. Matthew United Methodist Church, Frankfort. Family and friends may visit from 2 to 8 p.m. Monday, January 27th at Archer-Weston Funeral Home and Cremation Service. In Lieu of flowers, the family requests that memorials in Patty’s honor be made to her Frito Lay Relay for Life Team. Burial will be in Green Lawn Cemetery. Cindy(Pete) We were saddened to hear of Patty’s passing. She touched alot of people with her service to others. Praying for Gods hand of peace and comfort for you and the family at this time. I knew Patty many years ago. She was a very sweet person. We’ll keep her family in our thoughts and prayers. Patty was a joy to know. I am so sorry to hear that she lost her battle. You have my deepest sympathy for your loss. She was an inspiration to all. My heart aches with you. You are a beautiful woman and your mom lives on through you and your strength, wisdom, compassion and caring. Know we are praying for you as you face the next steps in your own journey. Love, hugs and prayers. My prayers and condolences go out to the family. I had many good times with her in our youth glad too have been lucky to share those times with her. RIP Patty Wann what a lovely lady!! I enjoyed working with Party at Frito Lay many years ago. So sorry for your loss. God Bless Patty’s Soul. My Prayers and condolences for her Family, Friends, and Frito Lay family. So sorry for your loss, she was a good person.. So sorry to hear of your loss….and really a loss to all her family and friends. She was truly an inspiration to us all. What a sweetheart came walking through the gates of heaven that day! I pray for Diana and the entire family to have peace in their hearts soon. Words cannot express how sorry I am to hear of Patty’s passing. Will be praying for you all in this time of need. Diane and Family, You are all in my prayers. And you have my deepest sympathy in the loss of your beloved Daughter Patty.